Written for Stewart Adam in recognition of his award of the RSCDS Scroll of Honour at the AGM in Perth in November 2015 and first danced at the Edinburgh Branch Christmas Party in December. The dance was originally submitted to the RSCDS with Wing Commander Donald Mackenzie's Reel as the suggested tune for the reel part. Since this tune was deemed too difficult and it wasn't possible to obtain copyright clearance for reprinting it in the book, Iain MacPhail (a good friend of Stewart Adam's) was asked to compose a reel tune for the dance. This tune – Stewart Adam – Bon Viveur – is the one that is now in the RSCDS book. Added on: Aug. 2, 2018, 8:05 p.m.
Added on: Oct. 12, 2018, 1:06 p.m.
2018 Christ Church Christmas Bazaar Demo 2018-11-24 Ann Murray Nov. 12, 2018, 9:52 a.m.
DA 2018-03-23 Chris Ronald March 17, 2018, 11:52 p.m.
Budapest Local Club 17.09.2016 2016-11-17 Zoltán Gräff Nov. 18, 2016, 10:34 a.m.
Oldenburg 2016-11-21 2016-11-21 Martin McWilliam Nov. 19, 2016, 5:36 p.m.
Rhein-Main-Mini-Social, 3. September 2018 (DA) 2018-09-03 OnYourToes Darmstadt Aug. 12, 2018, 9:19 p.m.
Class 11-7-17 2017-11-07 Sarah Harriman Nov. 14, 2017, 7:03 p.m.
FSCDC Class 27 February 2018 2018-02-27 Anselm Lingnau Feb. 28, 2018, 2:26 a.m.
Rhein-Main-Mini-Social, 19. 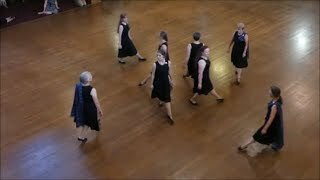 Oktober 2018 (MZ) 2018-10-19 Narhalla Dancers Oct. 16, 2018, 10:20 p.m.
Proitzer Mühle SCD Intermediate (2017-12-27 to 2018-01-02 2018-12-27 Roland Ritthaler March 16, 2019, 1:52 p.m.
RSCDS Wirral - Tuesday 12 January 2016 2016-01-12 Andrew Locke Jan. 10, 2016, 8:33 p.m.
Oldenburg 2019-02-20 2019-02-20 David Quarrie March 14, 2019, 5:13 p.m.
Darmstadt_2018_08_27 2018-08-27 OnYourToes Darmstadt Aug. 26, 2018, 5:10 p.m.
wscds 2018.10.17 2018-10-17 Keira Hartstein Oct. 15, 2018, 4:44 a.m.
Oldenburg 2019-03-11 2019-03-11 Judith Kowalczik March 15, 2019, 10:46 p.m.
NY Branch 2018 Dec 13 2018-12-13 Charlotte Holton Dec. 9, 2018, 11:43 p.m.
2018-11-05 Nürnberg 2018-11-05 Annette Lotz Nov. 7, 2018, 9:28 p.m.
GASP - February 8 2019 - Betty Anderson 2019-02-08 John Bottriell Jan. 7, 2019, 4:50 p.m.
Hamburg Class 2019-03-21 2019-03-21 David Quarrie April 11, 2019, 11:22 a.m.
Westchester 17 April 2019 2019-04-17 Peter Price April 16, 2019, 4:41 p.m. Monthly Party January 2019 2019-01-12 Kent Smith Jan. 10, 2019, 8:45 a.m.
RSCDS SF Party - Jan 2019 2019-01-12 Rachel Pusey Jan. 7, 2019, 3:19 a.m.
RSCDS New York Branch Dec 13 2018 Basic Class 2018-12-13 Xiaowen Yu Dec. 10, 2018, 3:26 a.m.
March Monthly Party 2019-03-02 Tovar - Feb. 6, 2019, 11:51 p.m.
RSCDS San Francisco Monthly Party March 2019 2019-03-02 Charlotte Greig Feb. 27, 2019, 7:09 p.m.
RSCDS SF Party - Mar 2019 2019-03-02 Rachel Pusey Jan. 7, 2019, 3:32 a.m.